Retire Right, the definitive guide to retirement and retirement planning in South Africa, has been rewritten and updated as The Ultimate Guide to Retirement in South Africa and is now available in bookstores and online as an eBook. The Ultimate Guide to Retirement in South Africa is written by myself and Bruce Cameron, the retired editor of Personal Finance. Since introducing the book in June 2018, the first imprint of 7 000 copies has been sold out, making The Ultimate Guide a national best-seller. The publisher, Zebra Press, has since printed a second consignment, which is now available. In writing The Ultimate Guide to Retirement, Bruce and I tried to cover as many aspects of retirement as possible. This includes the preparations and planning for retirement, the psychological aspects, the legal issues, issues that affect women in particular and even the administrative issues. We also cover topics such as discretionary investment products, buying a pension, civil service pensions, women and retirement, estate planning, the psychology of retirement, social grants, tax and healthcare in retirement. The Ultimate Guide to Retirement in South Africa features a foreword by finance minister Pravin Gordhan, in which he highlights the many recent changes in pension regulations and references recent research that shows that people often do not have enough information available to enable them to make the right decisions at and after retirement. The book provides comprehensive guidance and even identifies warnings on pitfalls one needs to avoid. 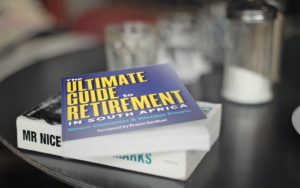 The Ultimate Guide to Retirement in South Africa has been recognised by the Financial Planning Institute (FPI) for the quality of the content and has approved the book as an FPI Recognised Publication for CPD purposes for financial advisors and planners. For more information on The Ultimate Guide to Retirement in South Africa by Bruce Cameron and Wouter Fourie CFP, please visit www.retirementplanning.co.za.